TORONTO, July 18, 2018 – When a Canadian taxpayer is facing a tax audit from the CRA, the conduct and methodology of the tax auditor are subject to a "reasonable minimum standard." If the tax auditor meets this standard, the burden of proof is shifted onto the taxpayer to show the tax auditor's assessment is incorrect. If the tax auditor fails to meet this standard, the Tax Court of Canada could nullify the result of the tax audit assessment and uphold the taxpayer's original filing position. The leading case on the reasonable minimum standard is Huyen v the Queen. In the Huyen case, the taxpayer operated a convenience store in Quebec between 1991 and 1994. Revenue Quebec, which administers the collection of GST in Quebec, tax audited and assessed the taxpayer for GST not remitted plus interest and penalty. Revenue Quebec carried out a tax audit of the store because the GST numbers filed did not correspond with the norm of the average GST remittances of similar stores. They audited the store for three months, for August, September and October of 1993, and extrapolated that data onto a 39 months period. This is a standard tax audit methodology and is often flawed. The tax auditor found the accounting records to be crude and incomplete so he went to the store for three days and observed that some transactions were not recorded. The tax auditor then calculated the total amount of GST owing based on the statistical extrapolations. The taxpayer filed a notice of objection and her file was re-examined. However Revenue Quebec still assessed her for a considerable amount of unremitted GST plus penalties and interest. The taxpayer testified that she collected GST to the best of her knowledge, and that Revenue Quebec's tax audits did not take account various transactions, such as returns, discounts and tax free items sold, which resulted in a lower amount of GST remittances than the tax audit showed. In addition the sales of certain items such as individual cigarettes were recorded at the end of the day. Furthermore, the taxpayer argued that the methodology of auditing for three months and extrapolating the data onto the remaining period is inaccurate. The Tax Court of Canada found in favor of the taxpayer. When a taxpayer is being audited, the burden of proof to show the self-assessed amount is correct is on the taxpayer. The taxpayer will be asked to show that he or she has kept accurate records. However, the burden of proof does not exempt the Minister from his duty of proceeding according to reasonable minimum standards which allow him to arrive at a credible conclusion. The Judge considered the extrapolation to be legal but not reliable. Especially considering the taxpayer had kept good accounts in the circumstances. The CRA has a duty to perform tax audits which meet a minimum standard of reliability. The fact that the burden of proof is on the taxpayer should neither legitimize incomplete work nor justify superficial work. The judge accepted the taxpayer`s testimony that the unrecorded sales observed by the auditor were recorded at the end of the day. The reasonable minimum audit standard test was applied again by the Tax Court of Canada in Telus Communications (Edmonton) Inc v. the Queen. The taxpayer, Telus, acquired business assets, including supplies, from a third party, E corporation. Telus claimed Input Tax Credits (ITC) on the supplies it acquired from E corp. The CRA denied the claim on the ground that Telus was not a "recipient" under the Excise Tax Act. In deciding the amount of ITC denied, the CRA's tax auditor used an extrapolation method in respect to small transactions. The taxpayer relied on Huyen and argued that the extrapolation methodology is unreliable and does not meet the reasonable minimum standard set out by Huyen, especially when full accounting records are available. The Minister acknowledged the reasonable minimum standard but argued the methodology employed was reasonable. In accepting the Minister's argument, the Tax Court of Canada held that the burden on the Minister was to proceed according to "reasonable minimal standards" which allow for a credible conclusion. Such standards will vary with the circumstances. In this case, the period the data was extrapolated onto was relatively short. The sampling and extrapolations may have been "minimal" but they were not unreasonable. The Court went on to say that the tax audit result creates a presumption that the taxpayer must rebut. Nevertheless, the Tax Court did have some reservations about the methodology used by the tax auditor. 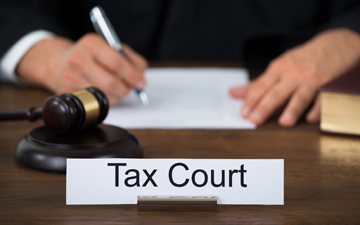 The Tax Court held the court has discretion in making adjustments for the benefit of the taxpayer where it appears likely that the "estimate" methodology employed by the CRA does not give sufficient benefit of the doubt to the taxpayer. The CRA could have included using an error percentage based on the relative number of transactions where doing so favours the taxpayer or abandoning the extrapolation methodology where the incidence of "error" falls considerably below the confidence level in that methodology which is what happened in respect of the May transactions. In terms of challenging a tax audit based on auditing methodology, the take away from Huyen and Telus is that the tax auditor has a reasonable minimum standard in using a reasonable auditing methodology when conducting a tax audit. This standard is contextual, but seems to involve an obligation on the tax auditor to employ reasonable and well-accepted statistical methods. There appears to be an additional burden on the auditor to give the taxpayer some benefit of the doubt in accepting a reasonable explanation from the taxpayer and resolving error and ambiguity in favor of the taxpayer. Once the reasonable minimum standard is met, the burden is shifted on the taxpayer to show the tax auditing result was wrong and the tax return amount is correct. Mathur v the Queen is a leading case on the taxpayer's burden in rebutting the tax auditing result when the methodology employed by the CRA meets the reasonable minimum standard. In this case, unlike the taxpayer in Huyen, the taxpayer did not keep good records and the CRA conducted a net worth tax assessment on the taxpayer and made the tax assessment based on the increase in the taxpayer and his wife's assets. The Tax Court of Canada found the tax auditing method to have met the reasonable minimum standard, which then created a burden on the taxpayer to show that the tax audit was wrong. During the tax appeal, the taxpayer relied solely on attacking the tax auditor's methodology and did not call his wife who was the bookkeeper of the restaurant as a witness during the trial. The evidence the taxpayer gave was vague and general. Therefore, the Court found that the taxpayer did not meet the burden of proof. One possible way to overturn a reassessment from an audit is by showing the auditing methodology is flawed. If you have been audited or have been reassessed as the result of a tax audit, you should contact one of our experienced Canadian tax lawyers to find out if the auditing methodology is flawed and you can get the CRA or the Court to accept your original tax return filed.